Relax, reduce stress, and recover from workouts, hectic schedules, or everyday life. 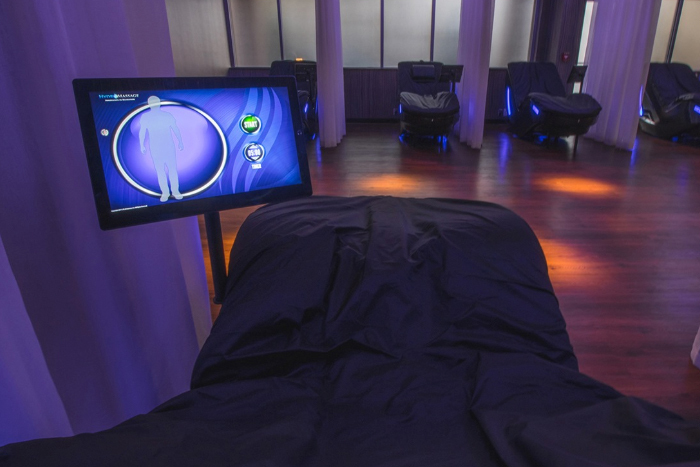 We created the CHILL by GHF HydroMassage Lounge to serve the whole person – physically, mentally, emotionally, and socially. The accumulated stresses of everyday life can damage your health in irreversible ways — from early aging to heart problems and long-term disability. While we know you cannot eliminate stress, you can manage it and it’s worth every effort to do so. 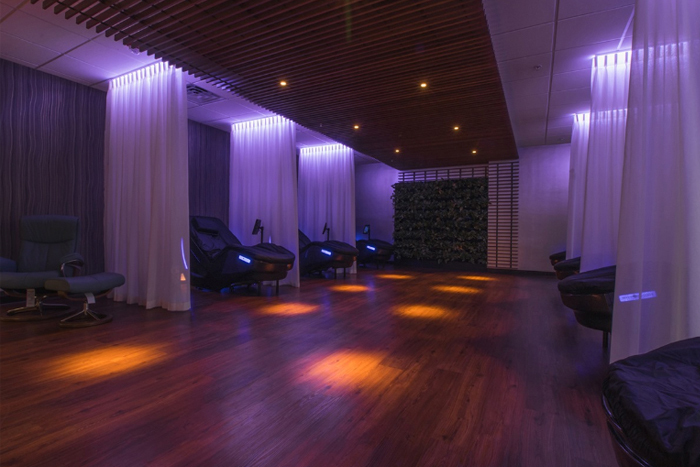 Your CHILL by GHF experience begins in our HydroMassage lounge and continues as your muscles and your mind relax to give you a one-of-a-kind post workout recovery. Each session is 10 minutes and will loosen up muscles, increase oxygen and blood flow into muscles, remove lactic acid buildup (which is what makes you sore), and deliver nutrients from your body to your muscles. You will walk out of the gym feeling like a new person. Introductory Pricing: 15 sessions for $15 a month with auto-renew feature, now available for a limited time. Stop by before or after your workout and try a complimentary session. Will I get wet using the hydromassage lounges? No. You will receive a full body massage with the use of pressurized water. You will simply lie down on the open design bed, fully clothed, and feel the immediate benefits of the traveling jet system. 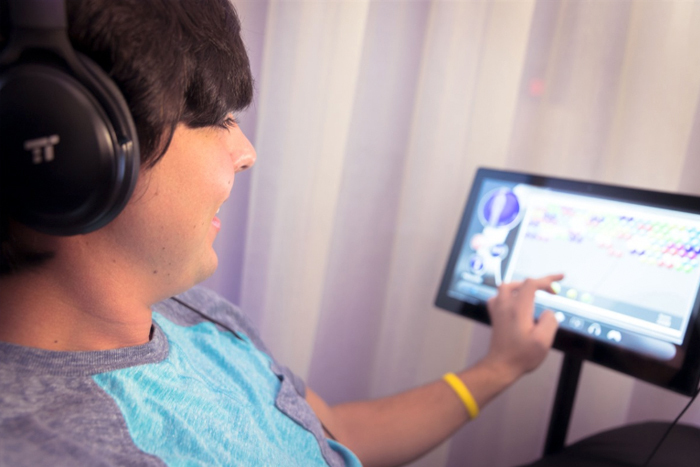 You will sign up for a Mind/Body account which will allow you to purchase Chill by GHF. We will show you how to do this. How many times a week should I do hydromassage? The frequency of use is up to you. You may use once a day or once a week. Introductory pricing is15 sessions for $15 auto-renewing monthly. Use all 15 sessions in each 30 day period-sessions do not carry over. Can I buy more if I use all of my sessions before 30 days? Yes! You can buy another 15-session package which will be non-reoccurring. This can be charged to your MindBody account (using the credit cards stored in the system). Can I buy a single session? Single sessions are not available. You may have a complimentary session to see what it’s like! If you enjoy it, you can purchase 15 sessions for $15 per month. Inform desk you would like to cancel. You may use the balance of your sessions remaining at cancellation. Am I able to do more than 10 minutes at a time? Yes, unless someone waiting to use a lounge. Can I buy a month (or more) for someone as a gift? Yes-gift must be for existing GHF member. Gift cards are available at front desk. Stop by the desk before or after your workout. With your free all-access pass, you will have full membership privileges for one day at any Gainesville Health & Fitness location. There is no charge, no obligation and no risk. There is, however, a chance that you will be inspired. Get ready for an experience that will help you get the most out of life and inspire you to become your best. We look forward to meeting you!